Recipes from a hundred-years ago often contain minimal directions and can be difficult to interpret. And, I occasionally come across old recipes that call for ingredients that are no longer available. Today is one of those times. 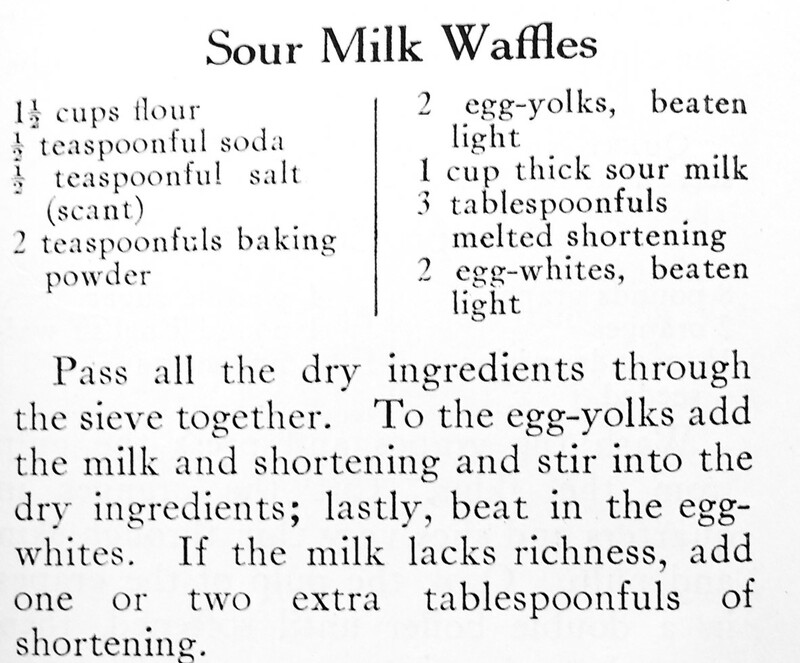 When I read a 1919 recipe for Sour Milk Waffles, I immediately knew that I was not going to be able to exactly replicate the recipe. A hundred-years-ago many families still lived on farms; and, even in towns, much of the milk that was sold was not pasteurized. Back then, if the non-pasteurized milk was not used quickly, the “good” bacteria in the milk would turn it into a sour milk suitable for use in recipes. Today’s pasteurized milk can be turned into a sour milk by adding a little vinegar or lemon juice to create a slightly curdled acidic milk. But this recipe calls for “thick sour milk.” The soured milk that I make with vinegar or lemon juice isn’t very thick. Then I remembered that milk in days gone by would have also contained cream that floated on the top. Perhaps the recipe is referring to the thickness of the soured cream. So, I substituted 1/4 cup sour cream, 3/4 cup milk, and 2 tablespoons vinegar for the thick sour milk. The recipe also says that if the milk lacks richness, add additional shortening. I decided that the sour cream added sufficient richness, and that no extra shortening was needed. I was pleased with how my updated version of Sour Milk Waffles turned out. 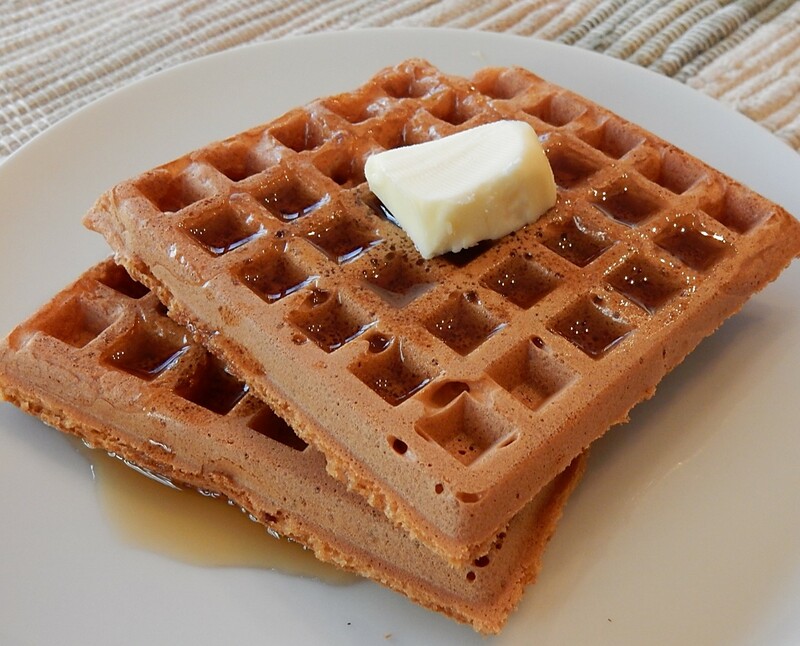 If you are looking for a soft waffle recipe, this is the recipe for you. The waffles had an old-fashioned goodness, and were very tasty. They browned nicely, and were fluffy and soft – though they were not crispy like most modern waffles. Put the milk in a cup or bowl, then stir in the vinegar. Set aside for at least 2 minutes. Put the egg whites in a small mixing bowl, beat until light and foamy. Set aside. Put flour, baking soda, salt, baking powder, shortening, sour cream, egg yolks, and milk soured with vinegar or lemon juice in a mixing bowl. Beat until smooth. Gently fold in beaten egg whites. Ladle batter onto a hot waffle iron and cook, following the waffle iron directions. Posted on February 3, 2019 February 2, 2019 by SherylPosted in FoodTagged recipes. Ah yes! I remember the cream that floated to the top of milk bottles. And my father was half-Polish, and prized various dishes that were made from sour milk. As we had no fridge in my earlier childhood, it wasn’t hard to please him. 🙂 There are a lot of tasty old recipes which call for sour milk. People a hundred years ago, knew how to utilize milk that was a past its prime, and turn it into something else that was very tasty. Milk didn’t keep as long years ago. The pasteurization process has gotten better over the years. In the 1960’s and 70s, milk lasted maybe 3 or 4 days after it was purchased. Now the “use by” date if often close to two weeks out in the future. Ultra-pasteurized milk lasts even longer. Love a good waffle! Good job on making a substitute for good old sour milk. You are so knowledgeable about how to make many of the wonderful old-time recipes. It’s good to know that you like how I adapted the recipe to substitute for old-fashioned sour milk. Your intuitive ingredients are the marks of a very good cook! Wow! They look delicious! just to clarify, you don’t mean buttermilk, right? Correct . . . I didn’t mean buttermilk. A hundred years ago buttermilk would have been the liquid left over after churning butter; whereas sour milk was milk that had soured. This is really interesting to learn. Did they have a sort-of sourdough flavor? This is a neat site. Where do you find these old recipes? They may have had a very slight sourdough flavor, but it was very nuanced. The most unique characteristic of these waffles was that they were soft (and not crispy). I find the recipes in hundred-year-old cookbooks and magazines. I hope that you post on your blog what you learn about suet. I’ve seen old recipes calling for it, but have never used it. Now I’m even more intrigued. A good friend often talks about how the miners on the Iron Range in Minnesota used to take pasties down into the mines to eat for lunch. I’m looking forward to hearing about what you learn. My post will be about the miners from the Upper Peninsula of Michigan who came over from Cornwall, England. Thank you! Adapting recipes is one of the things that I really enjoy about cooking. These waffles definitely look tasty! You are great at figuring out how to make the recipe replicate those of days gone by. I would have assumed the substitution would be buttermilk so I would have goofed! It’s nice to hear that you like this blog. I have a lot of fun doing it.